Caperea (top) from Bisconti (2012). Fin Whale (below) from Wikipedia Commons. Caperea has vertebrae counts and proportions that are strikingly different from any other whale. Cetaceans have four types of vertebrae: cervical (neck), thoracic (with ribs), lumbar, and caudal (tail, with chevrons sticking out below); unlike most mammals, there are no sacral vertebrae, which articulate with the hips. Perhaps the most striking difference between Caperea and the Fin Whale (Balaenoptera physalus) is the relative size of the ribcage. Caperea has 17 to 18 thoracic vertebrae, more than any other cetacean, but not much more than Fin Whales, which have 14 to 15 (Buchholtz 2010, True 1904). The extra length of the ribcage is thus mostly due to the elongation of the thoracic vertebrae themselves (Buchholtz 2010) and as a result, the relationship between vertebrae count and length is unlike that of any other cetacean (Buchholtz 2007). Another striking trait of Caperea is the very low number of lumbar vertebrae, with most individuals having one and one individual having none (Buchholtz 2010). In other words, Caperea has a tail coming (almost) straight out of its ribcage. Comparatively, Fin Whales have 14 to 16 lumbars (True 1904) and no other baleen whale has fewer than 10 (Tinker 1988). The River Dolphin Inia reportedly has as few as three lumbars, but it also has 13 thoracic vertebrae (Best & da Silva 1993), which is totally normal. It is likely there are some functional similarities shared between Inia and Caperea, but the proportions of Caperea reminded me more strongly of another aquatic mammal, and it’s not a cetacean. West Indian Manatee (below) from Wikipedia Commons. Contrary to what hypothetical future (or alternate universe?) palaeontologists may think, Caperea doesn’t look like a manatee at all. It pretty much looks like a Minke with an arched jaw. Stranded Caperea, from Te Papa’s Blog. Not only does Caperea look nothing like a manatee in life, it also doesn’t obviously function like one, being oceanic and reportedly a fast swimmer (Kemper 2009). Caperea is reportedly highly flexible (Kemper 2009), as is Inia (Fish 2002), so this makes me wonder if lumbar reduction results in a more flexible body, and that perhaps Caperea and manatees achieved this through a similar mutation. As documented in the three-part series from Tet Zoo (Part 1, Part 2, Part 3) Caperea has other bizarre morphology not shared with other cetaceans or manatees including huge and overlapping transverse processes as well as ribs that appear curiously loosely-connected. As for why it has any of this morphology or would need to be flexible, I have no idea. Te Papa’s Blog has lots of entries documenting the dissection of a juvenile Caperea, and it is really invaluable for seeing how the soft tissue and skeleton fit together. It’s certainly interesting that soft tissue doesn’t necessarily mean that animals were weirder than their skeletons would indicate, some externally look far more “normal” than they have any reason to. Buchholtz, E. et al. 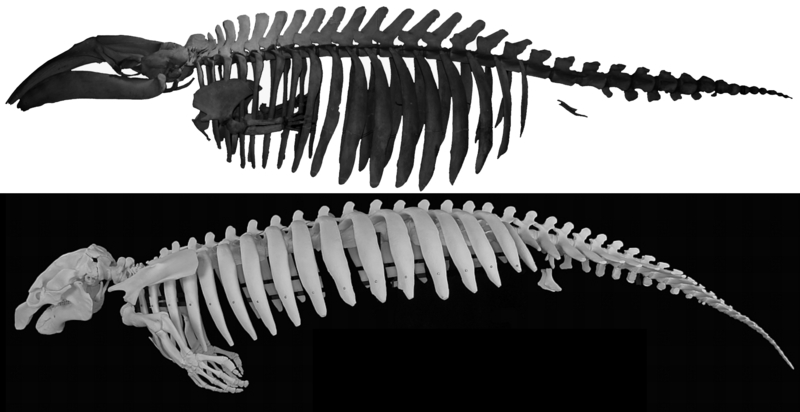 (2007) Vertebral anatomy in the Florida manatee, Trichechus manatus latirostris: a developmental and evolutionary analysis. Anatomical Record 290(6) 624—637. Fish, F. (2002) Balancing Requirements for Stability and Maneuverability in Cetaceans. Integrative and Comparative Biology 42(1) 85—93. Available. Kemper, C. (2009) Pygmy Right Whale IN: Perrin, W. et al. (eds.) Encyclopedia of Marine Mammals. This entry was posted in Cetaceans, Purposefully Ignorant Reconstructions and tagged Amphiptera pacifica, Baleen Whales, Caperea marginata, Cetaceans, Manatees, Marine Mammals, Mysticeti, Pygmy Right Whale, Sirenians on January 10, 2013 by Cameron.